In August of 2000 two ambitious local high school music students, with the help of other young musicians, their families and music teachers, created SOGO. Ample energy and a fresh vision for building a student-led organization make SOGO unique. 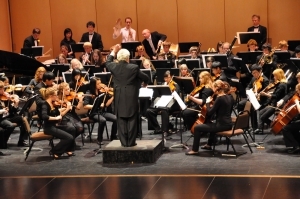 The first season, two orchestras were created and performed three concerts each. Other performances included the sold out SOGO HO HO Brass Choir holiday concert, a free-to-the-public Messiah Sing-Along, a Children’s Concert tour to local schools, and small ensembles performing at the spring Arts Walk in downtown Olympia. Now in our 2018-2019 season, SOGO has 140 young musicians from over 30 different schools in four counties. The concert season includes three performances in the Washington Center, two holiday concerts, and the Instrument Petting Zoo during the annual Olympia Spring Arts Walk. SOGO members are involved in weekly full orchestra rehearsals including, string and wind ensembles, brass choir, chamber music, sectionals, and music history and theory. SOGO features a comprehensive and sequential program designed to grow student abilities in sight-reading, basic to advanced instrument pedagogy and musical artistry. These goals are achieved by playing selections from the standard orchestral repertoire. Music is selected to represent various genres, cultures and historical periods. Using this quality literature, we focus on technique, rhythm, intonation, ensemble and listening skills along with individual, section and orchestral sound development. Music selections generally increase in difficulty as the season progresses and the foundations for good orchestral playing develop within the individual and ensemble.